You can practically hear the bagpipes playing when you behold this massive 56" Scottish heritage replica sword. The 41 1/2" stainless steel blade is heavy and stout with a false-edged blade and historic etchings. 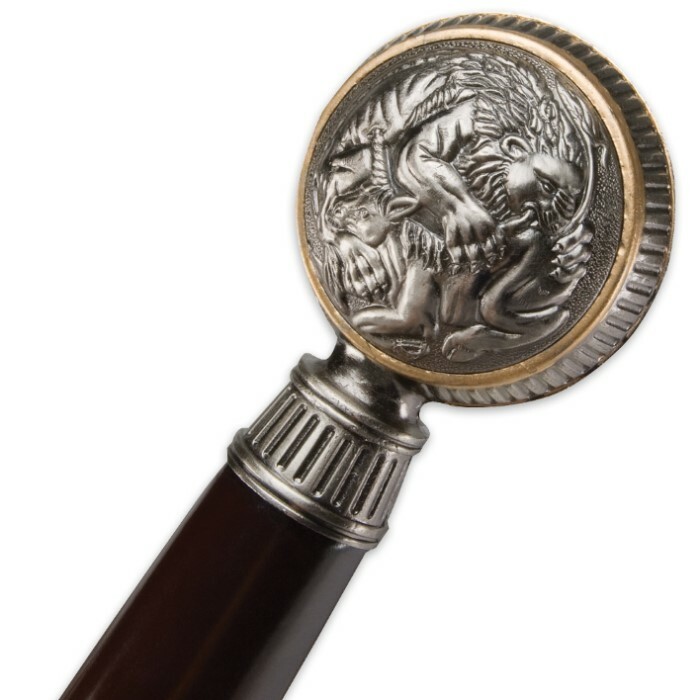 Traditional lion and unicorn designs on the gold-plated zinc pommel continue the ancient historical theme. The oversized decorative guard has antique-finished embellishments for added authenticity. It includes a wooden wall display plaque and measures 56 1/2" in overall length. 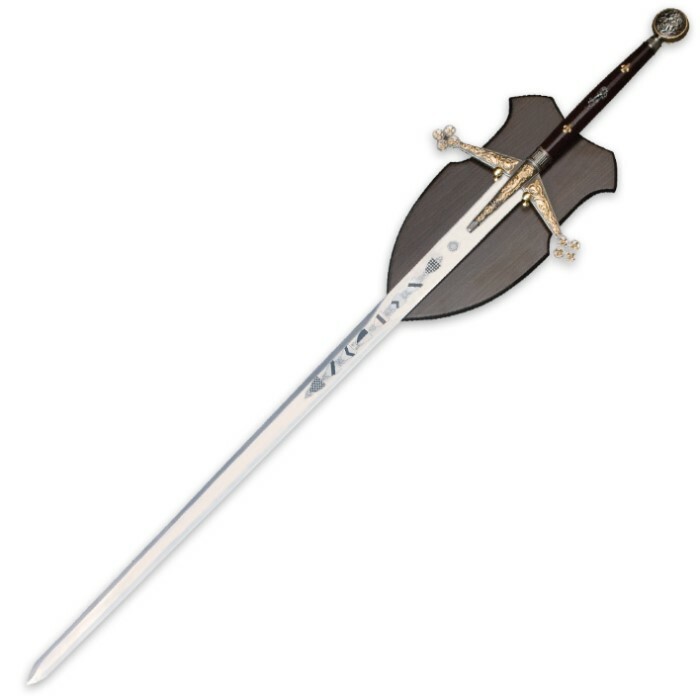 You cannot behold the true beauty of this sword until you see it for real. I was totally blown away by the craftsmanship. All 56 &1/2" of it. Well worth every penny. It's stunning! 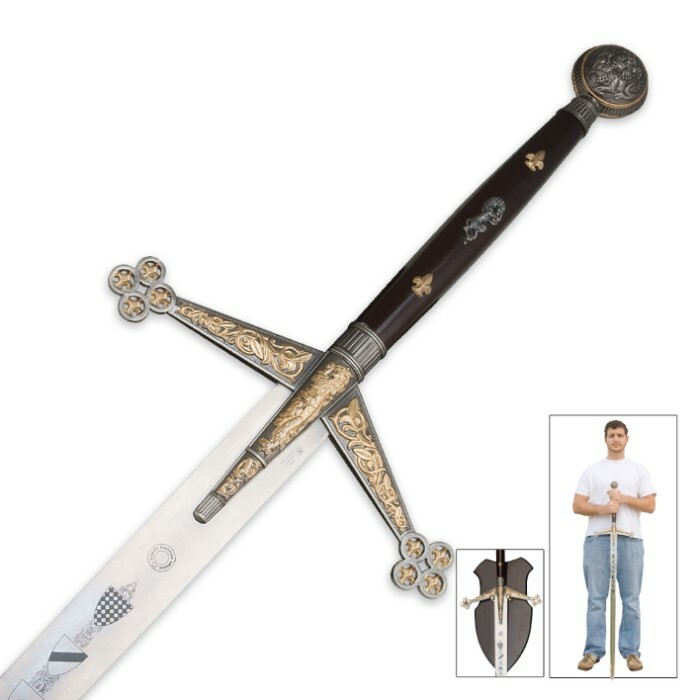 i got this in my first sword scratch and dent purchase and it is still 1 of my favorites its not a fuctional sword only decoration of coarse but it is huge i just love it if ur looking for wow factor this is it and it has a unicorn on it!! just awesome did i mention it has a unicorn lol. This Scottish Claymore became my favorite sword as soon as I got it out of the box. The handle, guard & pommel are just beautiful. The blade isn't bad to look at either. This would be a great sword for any collection, especially if you have any Scottish background like myself. I highly recommend this sword. I ordered this sword when the price dropped; and when it came in this afternoon, it made my day! The sword is a behemoth! Its not meant to be handled indoors by extremely tall people (like me) with low sheet rock ceilings. The blade is highly polished and absolutely beautiful, but a little loose in the handle/guard. It is, however, the heaviest and longest part of the sword, so a little wobble is fine with me. It is not a piece to be swung or to hit anything with, because its beauty is just too fantastic. This is my most prized sword ever! Thank you, BUDK, for knocking it out of the park yet again!